Ahead of the match at Banc of California Stadium, the U.S. Women’s Soccer team held a public training event. The USWNT have 60 days as of April 7, 2019, before they head to France to compete in the World Cup. There’s definitely a passion and personal drive that every USWNT member has that allowed her to stick to playing when so many girls drop out. The sport certainly has come a long way for women and is still growing. Even head coach Jill Ellis agreed an NWSL club would succeed in LA, which has proven to be a soccer city. The attendance of Sunday’s match was 20,941. The current team has carried on the competitive, high quality legacy that the 1999 team set. This team is tactically aware and attack aggressively. They have a lot of confidence and comfort playing with the younger players, such as Mallory Pugh. This starting XI against Belgium was different. It seems head coach Jill Ellis has been experimenting and building depth. The forwards came here to score and the team came to win, which they did. Carli Lloyd finally got her start after a long while and she nailed it by scoring a brace in the first 19 minutes of play. In the 20th minute Lindsey Horan got her goal. 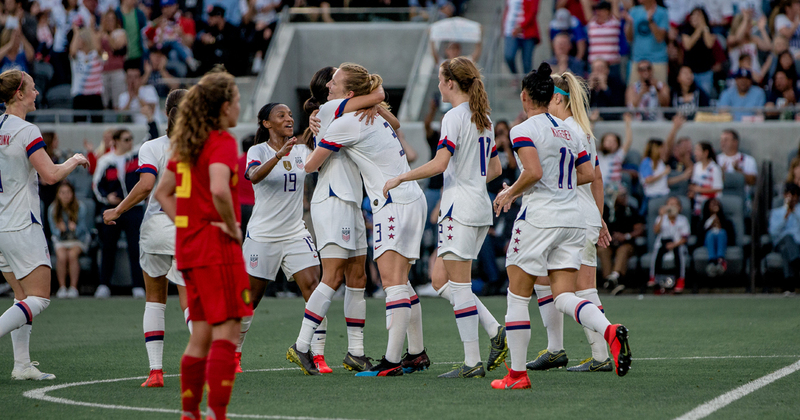 The U.S. was awarded a free kick in the 33rd minute and Samantha Mewis headed one in to put them up 4-0. It was an emotional experience to witness the 99ers honored at halftime. The fifth goal came from Alex Morgan and was the 101st in her career. The last was a header by McDonald for a final result of 6-0. The USWNT have three more matches after this one to prepare, and they are doing just that. These friendlies are imperative to finalizing the roster and strategizing for this summer. Lloyd proved that at 36 years old, she still has what it takes to be on that roster. Christen Press made good runs on the wing and crosses to get the ball in the box, resulting in three assists. These are ways the team can be described as they prepare for yet another World Cup. With a distinct variety of players, from record holders, champions, to new talent, they are ready to work together to shine as they defend their title and take on “hungry” international teams. Ellis has big decisions to make for the 2019 squad that no doubt are the favorites to win the World Cup. The USWNT take on South Africa and New Zealand in friendlies on May 12 and 16. Be sure to follow The Stoppage Time on Facebook, Twitter, and Instagram.